Galileo Galilei (1564-1642) published Sidereus Nuncius, or the 'Starry Messenger' in 1610. In it he provided a lively and accessible account of his telescopic work: his observations of the Moon and, particularly, his discovery and observations of four satellites around Jupiter. The lunar observations showed that the surface of the moon was not smooth and perfectly spherical, but was pitted with craters and had mountains. The observations of the Jovian satellites showed that the Earth was not the only centre of rotation in the universe. Both these discoveries were blows to the Aristotelian world-view which was geocentric and maintained that everything above the Earth was perfect and incorruptible. Telescopes, in the form of low-magnification spyglasses, were being made since the autumn of 1608. When Galileo heard of this new instrument he set about designing and making improved versions, with higher magnification. In August 1609, in a bid to improve his position at the University of Padua, he presented a telescope to the doge of Venice. He was rewarded with his contract at the University of Padua being renewed for life and with a more than two-fold increase in his salary. However, he was disappointed that the salary award precluded further increases and, being somewhat ambitious, he decided to look elsewhere for advancement. 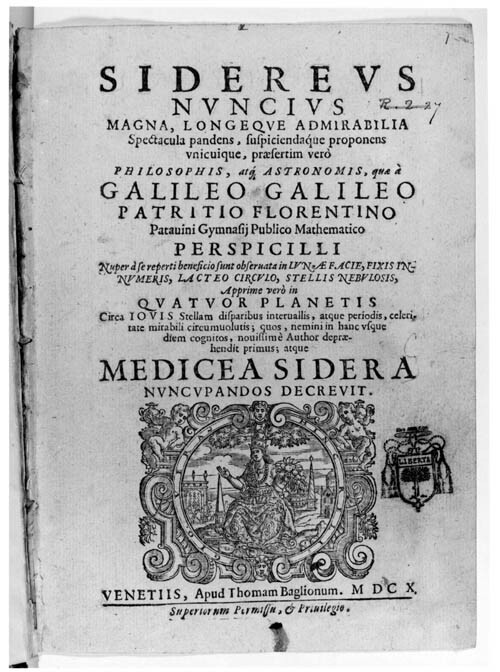 Galileo wrote to the Grand Duke Cosimo II de Medici about his astronomical discoveries (four years previously Galileo had been mathematics tutor to the young Cosimo and had kept in contact with him). Hearing that the Duke was extremely impressed he made the shrewd decision to name the moons of Jupiter the Medicean stars as a 'gift' to the Grand Duke. This gift is mentioned in the title page of the book, as well as in a flowery dedication. The Duke was sent an advance unbound copy of the books as well as a bound copy, together with the telescope Galileo used to make these discoveries. The Duke was thus not only presented with the discoveries but also with the instrument of discovery. 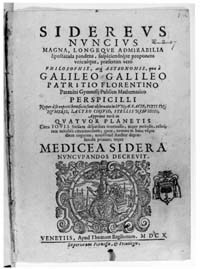 Here, Galileo's 'gift' of naming of the moons of Jupiter, his other discoveries announced in the book, and, indeed, the book itself and the telescopes developed by him and used in the observations all should be understood within the broader context of the gift-giving culture of the period. For example, Galileo sent telescopes as gifts to influential people; in such cases the telescopes were important not only as instruments but also as attractive objects. Accordingly, special attention was paid to decoration and tooling of the leather. Such unusual gifts announced the special skills and talents of the giver, and helped him to publicise his case for patronage. This page is Copyright 1999, Kemal de Soysa and the Department of History and Philosophy of Science of the University of Cambridge. All Rights Reserved.